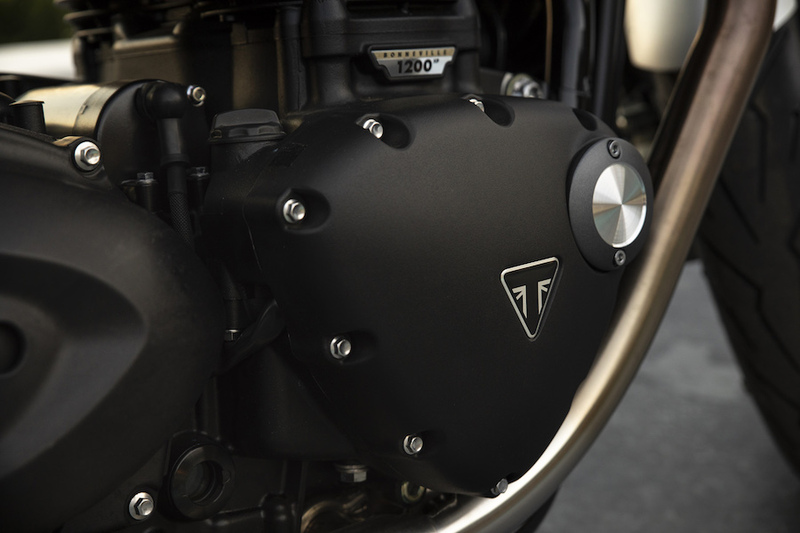 Check out Triumph’s ever-growing Bonneville family of Modern Classics, and until now you’d have found up to 11 different versions currently available of the British manufacturer’s iconic – yes, it’s the right word – parallel-twin range, which was resurrected back in 2000 by company owner John Bloor. 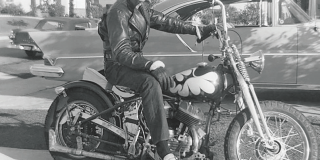 Since then, 313,994 examples of the born-again Bonneville have been produced, making up around 40 percent in any given year of Triumph’s production at its two factories in the UK, and three in Thailand. 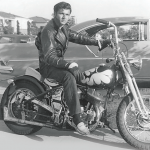 And now there’s a dozen with the release of the Speed Twin. 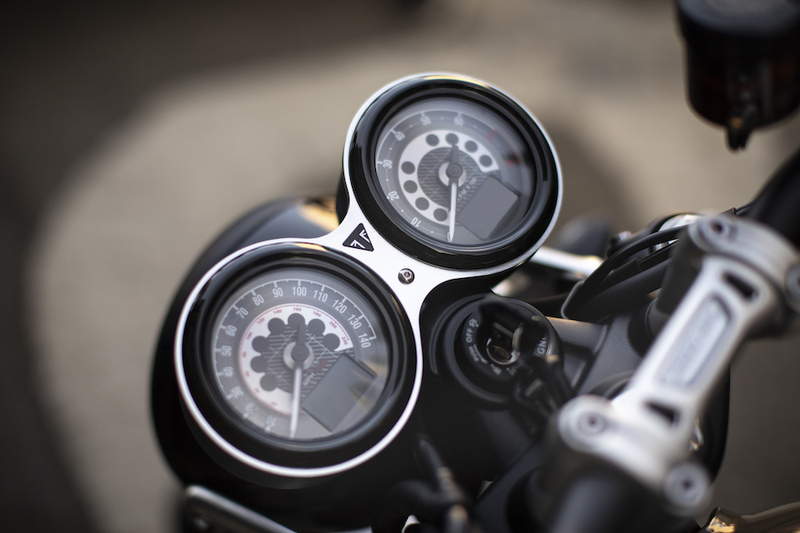 It marks the 80th anniversary of the model which essentially invented not only Triumph’s trademark design format, but what came to typify British motorcycles in the post-WW2 golden era – until the Japanese spoilt the party, that is. 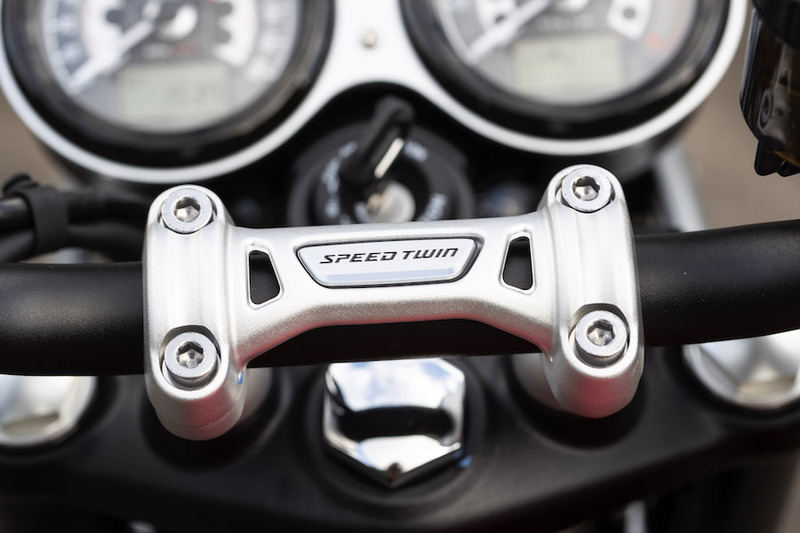 Triumph has now revived the Speed Twin designation to attach to a model that, just as it did eight decades ago, gives its customers more for less in performance versus price. The original version, initially produced in 1938 as the first-ever parallel-twin in the company’s line-up, brought new levels of performance and handling to the 500cc category – back then, the premium capacity class in British biking. 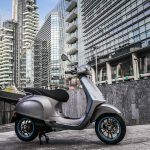 The new 2019 model of the same name strives to do the same via a clever combination of parts bin engineering coupled with empirical development, as expressed via a total of 80 new. 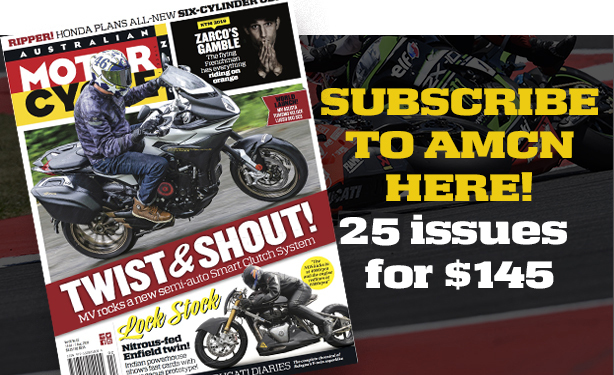 The chance to ride the result on a 270km day bisecting the mountainous Spanish Balearic Island of Mallorca where local hero Jorge Lorenzo honed his skills, provided an insight into Triumph’s ambitions in creating the new bike – and, more importantly, whether they’ve been achieved. 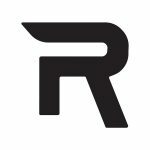 To achieve this, Triumph’s engineering boss Stuart Wood and his team essentially blended the best bits from other models in the now three-year-old 1200cc Bonneville range, to produce a retro-styled roadster with hair on its chest. 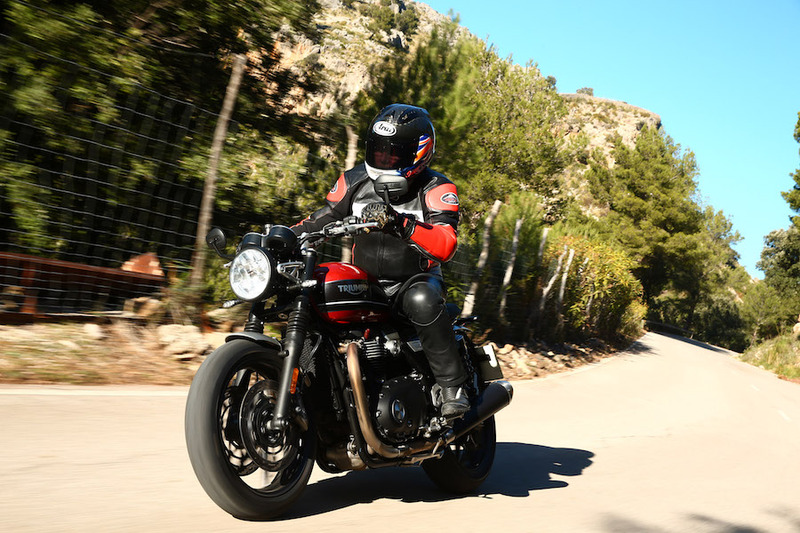 That’s been done by combining the character and comfort of the T120 Bonneville at one end of the scale, with the performance and handling of the Thruxton R at the other, all wrapped up in a subtly restyled butch version of the smaller-capacity Street Twin models. 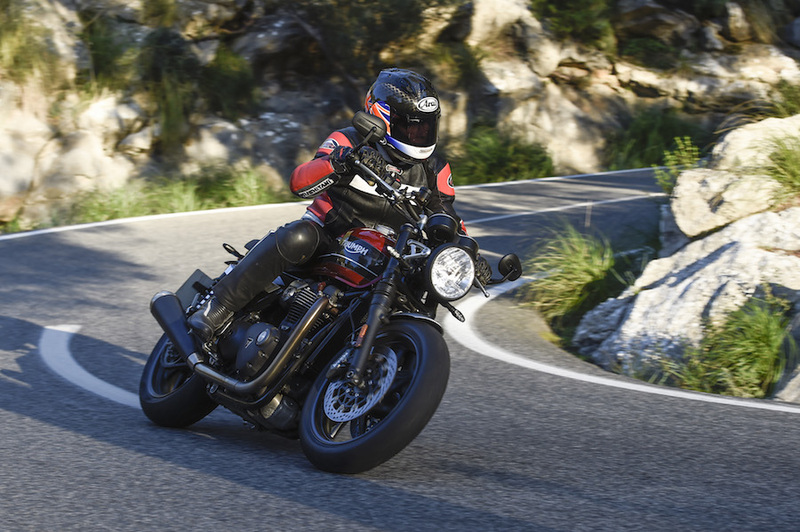 But Triumph’s marketing message misses the mark, since it insists on underlining that “with its 71.5kW delivered at 6750rpm, the new Speed Twin offers a 49 percent increase in peak power over the current Street Twin, and its peak torque of 112Nm at 4950rpm is 40 percent more.” And you’d hope so, since there’s a one-third or 300cc difference in engine capacity between the two, making the comparison irrelevant. 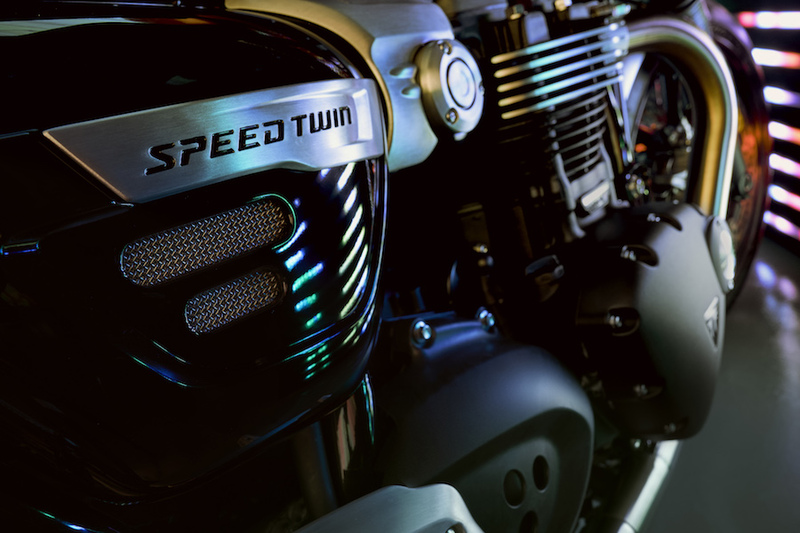 What’s much more interesting is that the new Speed Twin delivers 20 percent more power than the same-capacity 59kW Bonneville T120 alongside it, which is both heavier and delivers seven percent less torque (105Nm) than the new model. 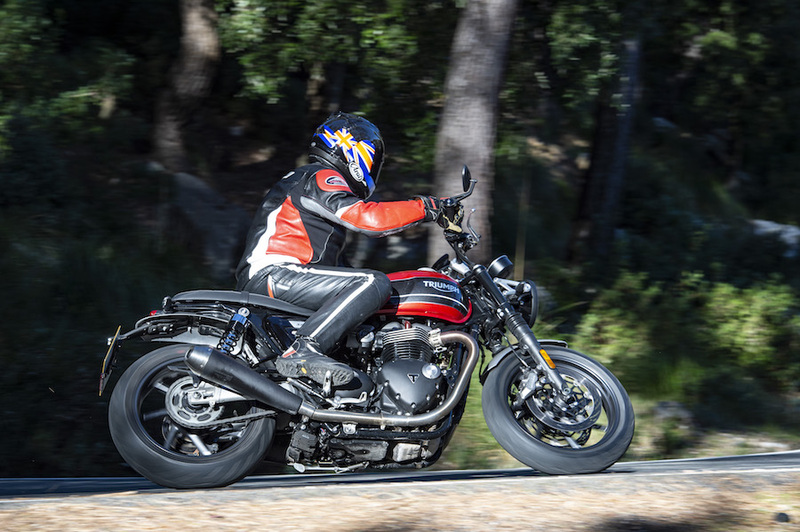 Yet the biggest surprise comes when you compare price tags – for the lighter, more powerful Speed Twin is yours for £10,500 ($18,920) in the UK (Triumph Australia is yet to confirm pricing), compared to £10,600 ($19,100) for the T120. Yes, 100 quid less before we even get to comparing specifications. In fact, that Speed Twin price tag is for the Jet Black base model, with an extra 300 quid charged for either of the two-tone options. But still, it highlights my point of getting more for less, just at the detriment of the T120. To obtain this level of extra performance, Wood & Co. basically took the High Power version of Triumph’s liquid-cooled SOHC eight-valve motor with 270º crankshaft measuring 97.6 x 80mm for 1198cc, and while retaining the same power and torque figures as the Thruxton café racer, effectively increased performance by reducing weight. 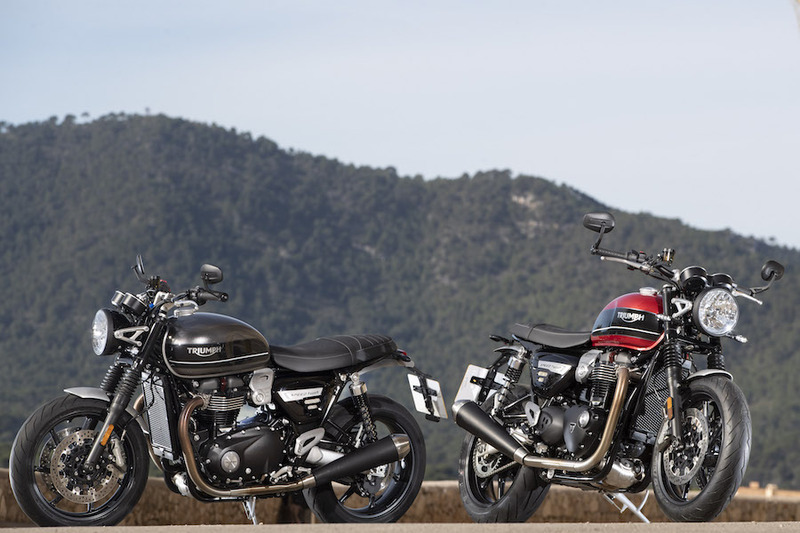 They did so in the same way as in concocting the new Scrambler 1200 models, so the Speed Twin engine is 2.5kg lighter than the T120 or indeed the Thruxton versions, according to Wood. 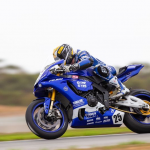 “We’ve done quite a lot of work on reducing both mass and inertia in the HP engine,” he says. “The mass reduction comes from a lightweight magnesium cam cover, plus a mass optimised clutch cover, which we’ve completely redesigned internally to get the wall thicknesses thinner, and the shafts that the twin balance shafts run on have been reduced in mass. We lightened the rotating parts, including the alternator and the crankshaft, so the engine picks up revs quicker. A comprehensive makeover, even though we’ve kept the same cam profiles as before.” The revised motor also features a long service interval of 16,000km, and the 14.5-litre fuel load delivers a range of around 290km, they say. 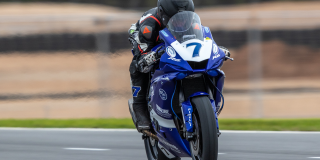 That focus on reducing inertia in the engine has been matched by a similar strategy in developing the Speed Twin’s chassis, as Steve Sargent explains. So the 196kg Speed Twin scales a considerable 10kg less than the Thruxton, and seven kilos lighter than Triumph’s most expensive and most sports-focused Bonneville model, the Thruxton R. The seven-spoke front wheel, which Triumph reckons is the lightest cast aluminium wheel of its kind across the industry, combined with the twin 305mm braking assembly which is 2.9kg lighter than the Thruxton’s, translates to a 28 percent reduction in inertia on the front end of the bike. And you can really feel it, too, as you’re flicking the Speed Twin from side to side through the switchback mountain turns of Lorenzoland. 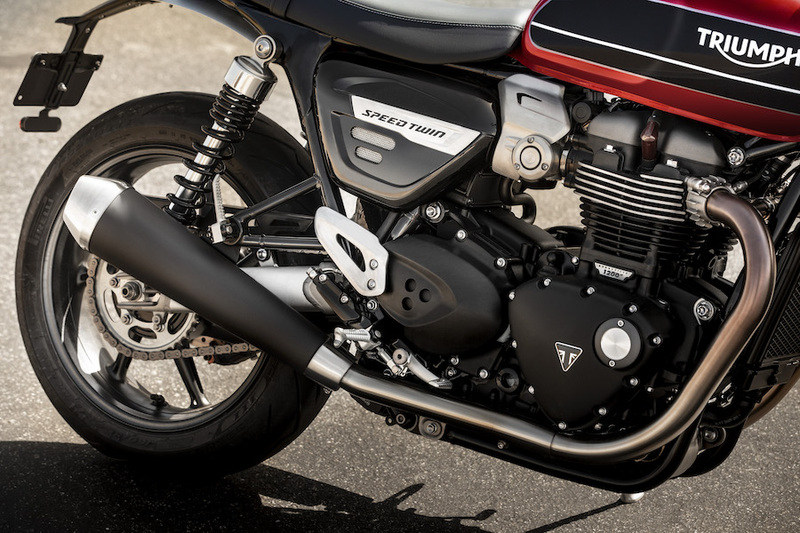 Triumph has also replaced the duplex frame’s tubular steel cradle with an aluminium equivalent – the first time such a hybrid chassis design has been used on any Bonneville model. 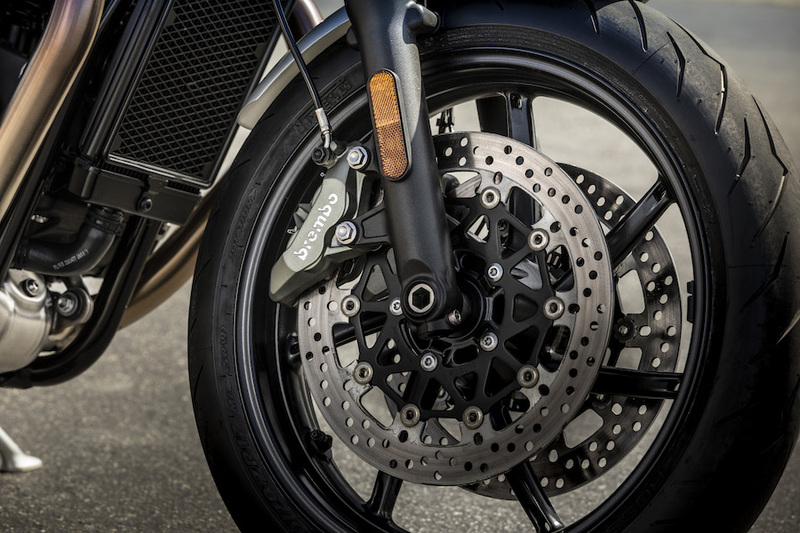 Furthermore, they’ve taken another 1.6kg out of the rear wheel and its single 220mm disc with Nissin twin-piston floating caliper, representing a 41 percent reduction in inertia over the Thruxton, while the lead-acid battery has been replaced by a lighter sealed lithium-ion one. 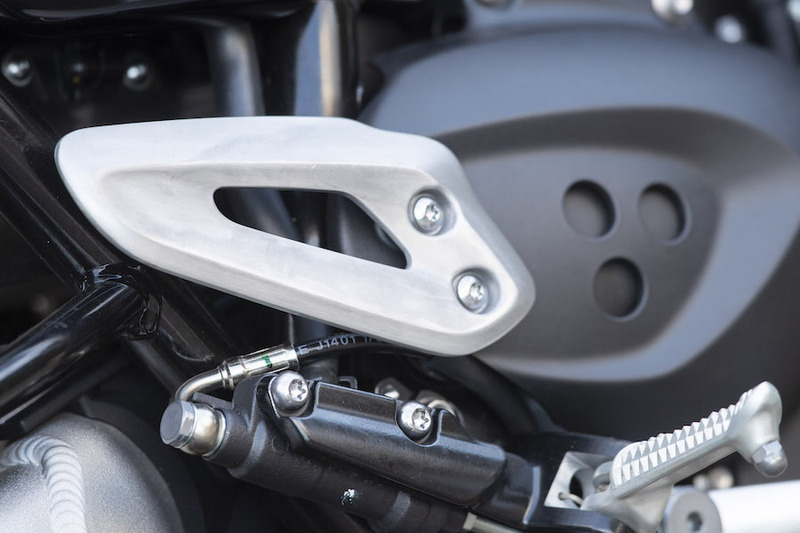 However, to calm down the handling, Sargent says they’ve lengthened the wheelbase by 15mm to 1430mm via a longer chain while retaining the same cast aluminium swingarm as the Thruxton, and have dialled in extra trail at 93.5mm, while taking the non-adjustable 41mm Kayaba cartridge fork’s rake out an extra 0.1º to 22.8º. “If we hadn’t done that it actually starts to get a little flighty, so we had to make those changes to the chassis to get the stability back after reducing weight and inertia so substantially,” he revealed. 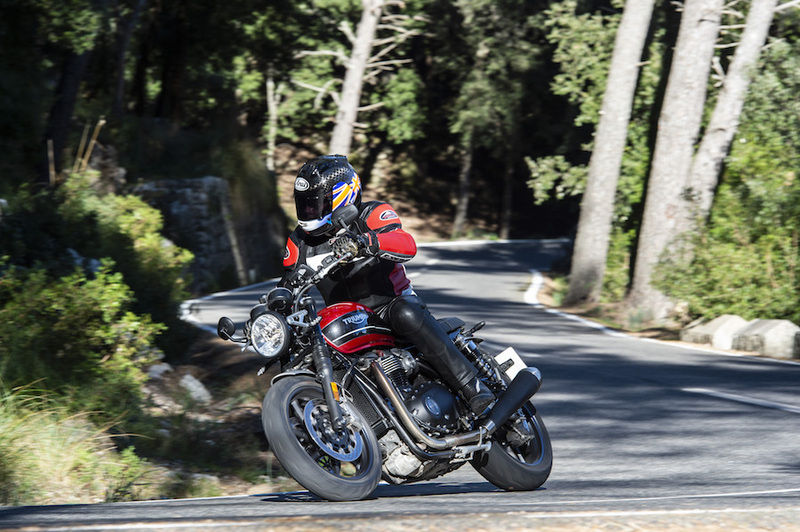 Overall, the weight bias is now slightly more front-loaded on the Speed Twin, going from the Thruxton’s rear-end heavy 48/52% to a balanced 50/50%. 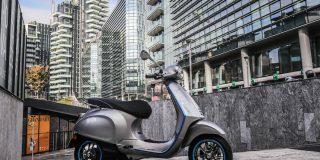 Once you leave the city streets – where the light-action cable-actuated slipper-type clutch and precise shift action of the six-speed gearbox make coping with traffic completely unstressful – and head for the hills, you immediately sense the substantial improvements. That comes after throwing your leg over the same flat, fairly low 805mm bench seat as the Thruxton, but with 10mm of extra padding, to find the footrests have been moved 4mm lower and 38mm further forward to deliver a more relaxed riding position in conjunction with the repositioned aluminium taper-section handlebar mounted on taller risers. This makes for a much more comfortable stance than on the Thruxton, although with the revised footrest location I’d have liked the seat to be a little taller. 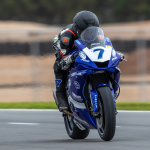 At 180cm in height, my knees got a bit cramped during a seven-hour day spent chasing the wheeltracks of – no, not Jorge Lorenzo, but someone with a different kind of riding expertise, two-time Isle of Man TT winner Gary Johnson. But shorter riders will find the Speed Twin very accessible, aided but the shape of the seat. However, height has nothing to do with the accessibility of the engine performance, because quite simply this is a T120 Bonneville on steroids, or a more rational version of the Thruxton R. A look at the power and torque curves shows you what to expect, because revs are almost irrelevant. It pulls wide open in top gear from 2000rpm, but with a practically flat torque curve all the way to the 7500rpm soft-action limiter as shown on the retro-style tacho mounted alongside its speedo sister. 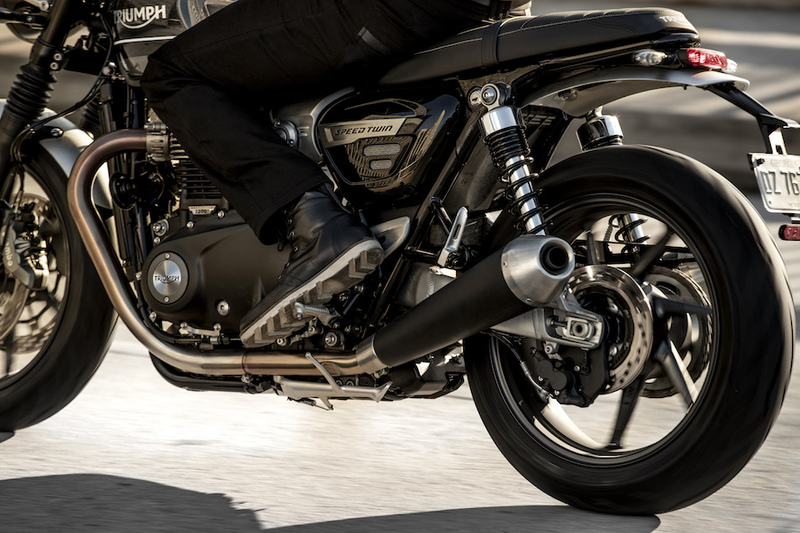 The exhaust note from the good-looking tapered megaphone-style cans matches the performance, with a lovely throbbing beat that’s the closest thing yet on a modern generation Bonneville let’s-pretend-I’m-a-V twin engine with its 270º crank to a 360º parallel-twin Triumph of yesteryear. But the result is a motor with real mumbo, and presumably aided by the lighter weight, acceleration is definitely impressive all the way through the revband in Sport mode, the most zestful out of the three available via the Keihin ECU’s RBW throttle programme. But it’s not so bad in Road, either, which you’ll want to use if the pretty aggressive throttle response in Sport isn’t to your liking. Though we had glorious winter sunshine throughout our chilly ride, I found Rain really good for town work, as well as coping with slippery surfaces, and each mode delivers full power, but with different throttle and fuel maps, as well as varying degrees of (Continental, not Bosch) ABS and TC intervention. You can easily switch between modes on the move by thumbing the M-button on the left control pod, and there is quite a noticeable difference between the three. However, you have to really peer at the small marking in the speedo’s digital panel to decipher which mode you’re in – and, yes, I had my glasses on! Make it bigger please, Triumph. There’s really great top gear roll-on between 5000-7500rpm when, even at higher revs, the Speed Twin just keeps on pulling. Ton-up (160km/h) cruising at 5600rpm is a definite option on autobahns, and despite the taller handlebar compared to the Thruxton, you don’t get so badly windblown at such high speeds, thanks to the slightly inclined stance it delivers. 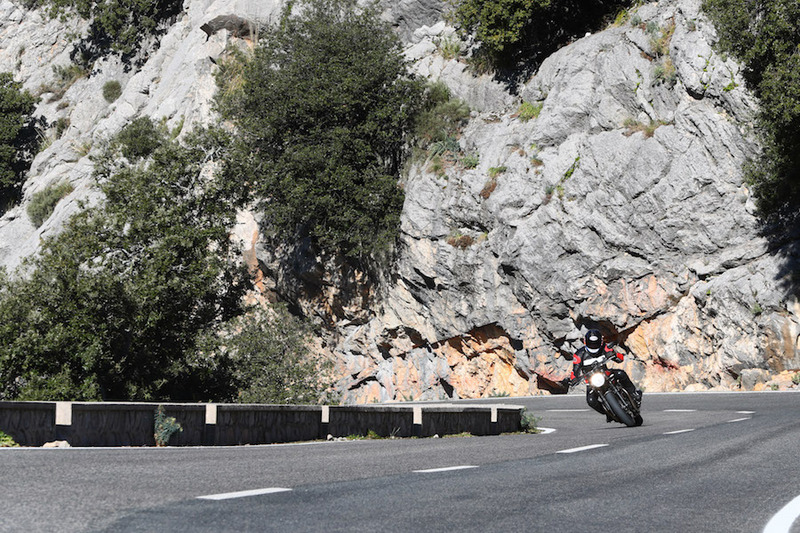 But swinging from side to side through a switchback succession of fourth-gear bends is the Speed Twin’s natural habitat, before clicking into top for longer straight stretches. There, 4000rpm in top gear equals 100km/h. 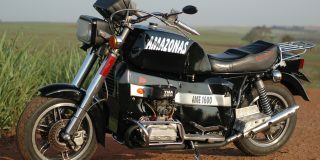 This is an accessible a motorcycle which asks to be ridden hard, although a powershifter would be welcome to help keep it revving hard, even with the lighter crankshaft. 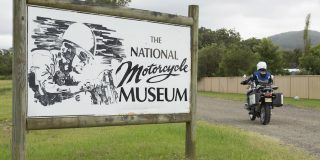 You honestly do notice the lighter steering and easier change of direction immediately, as soon as you start swinging from side to side through any tight sections of road – it has an eager, willing feel to the handling, aided by the comparatively narrow 160/60-17 rear tyre, which inevitably helps deliver agility. Yet when you round a turn to find a family of goats milling around in the middle of the road, the four-piston four-pad Brembo (albeit non-radial) calipers do an excellent job in delivering a controllable but effective panic stop, without any instability.